Notorious for mountains of burning garbage that choke the air, Lixeira is where the planet's poorest of the poor live, in the middle of nowhere. Without the aid of UNICEF and missions like the one Paul helped, local children would have died long ago. Paul's €210 that his paintings brought is a fortune in Luanda's slums where child labor is common practice. In the child's uncluttered mind, religion, race, prosperity and poverty melt just like ice-cream or snow. In fact, Paul says that if he had a magic wand, he “would make snow for everyone," so much he likes the stuff. The self-taught painter lives in a German village with his parents. Half American, half Romanian, Paul has a dream. He is craving to go to his father’s hometown, the oldest city in America, Charleston, to take part in the Spoleto Festival USA and Piccolo Spoletto arts event in South Carolina in May. 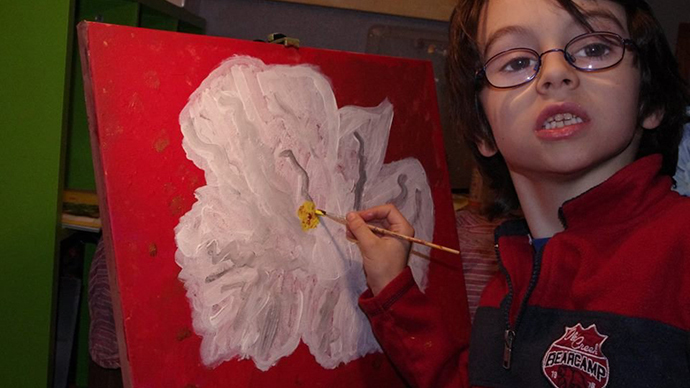 The little boy is curious to see whether people would enjoy his paintings. But - first and foremost - Paul says he wants to talk to the Indians. "Are there any of them left in America?” he wonders. Paul’s parents have set up a crowd-funding effort at Indiegogo to raise money for the trip.